Our program offers a low teacher to student ratio, allowing players to quickly progress in their game. Each class is one hour in length and will be customized to fit the needs of each participant. A boot-camp style program for ages 7-12 years which integrates basic Mixed Martial Arts movements into every class to create fun, full-body workouts in a small group setting. This program focuses on developing body awareness and coordination, aerobic and anaerobic conditioning, balance and strength and confidence. Classes have a maximum of 6 participants to allow for personalized instruction. Our Kids Sports Program will keep children engaged as they learn new skills in each class. Our focus in on building confidence, strength and physical literacy. We offer a variety of sports opportunities including basketball, soccer, hockey, badminton and more! Our Sunshine Yoga for Kids aged 4-12 is centered around positivity and playfulness while focusing on balance and concentration through yoga poses. Children will be introduced to meditation and breath-work, stories, music and obstacle courses which will vary with the theme of each class. Classes are offered Sunday mornings at 10:00am starting January 20, 2019. The Primal MMA Kids program was developed as a great way for children to learn self-discipline, body awareness and basic techniques in a fun and safe environment. Along with the basics of martial arts we help teach self-control, respect and life skills as well as anti-bullying strategies. Kids mixed martial arts draws inﬂuence from multiple disciplines including Judo, Karate, Jiu Jitsu and Muay Thai, however our focus is on Brazilian Jiu Jitsu, the most benﬁcial and safest martial art for kids. Junior Members Club is a complimentary program for Mayfair Lakeshore members who are between the ages of 8 and 12 years old. This program has been designed for juniors who would like to drop-in after school for a variety of activities, such as sports, social events and much more! For more information or to register, contact our Aquatics Supervisor and Sports Coordinator, Keira, at lakeshoreaquatics@mayfairclubs.com. Our Little Sports Club offers children (aged 4-6) multi-sport programming which focuses on developing basic sports skills in a fun, safe and inclusive environment. This program runs every Saturday from 11:00am to 12:00pm. For more information or to register, contact our Aquatics Supervisor and Sports Coordinator, Keira, at lakeshoreaquatics@mayfairclubs.com. Our Junior Golf Clinic offers your child a place to learn golf from certified golf professionals in a fun and motivating environment. Athletes in the program work on sport proficiency in a blend of activities to improve their game on and off the course. Hourly semi private clinics are available on both Saturday and Sunday mornings. This clinic is appropriate for kids aged 5-17 years. Calling all Junior Jays! Mayfair’s baseball athletes swing for the fences in a 10-week program that calls on both veteran and beginner players. Athletes focus on the fundamental skills necessary to be successful on and off the field with comprehensive activities designed to develop both new and experienced athletes. This program is for kids aged 5-17 years of age. Mayfair’s athletes are led by none other than Lucas Birnstingl, former Scottish Premiership professional goal keeper. Coach Birnstingl puts your juniors through their paces with comprehensive drills and exercises that work the fundamentals of the sport and fine tune sport proficiency. Juniors enjoy an hour long practice, complete with warm-up, technical drills, a fitness component, and game based strategy. This clinic is great for all ages, beginners to veterans of the soccer pitch. This program is for kids ages 5-14 years. This year, fill your child’s holidays with engaging activities! Your child will learn to play tennis from certified professionals, in a safe and motivating environment. Afternoons at camp include recreational swimming, for a refreshing end to a fun-filled day. This program is for kids ages 6-17 years. Your child will learn the fundamentals of hip hop with this high-energy program. During each class, kids will focus on rhythm, footwork and upper body strength, finishing with a small dance demonstration for parents. At the end of the session, each group will perform a fully choreographed dance, to showcase their new skill. This program is recommended for those with 0-3 years of dance experience. Parents, please note that Tuesday classes will have different choreography from Sunday classes. Promote health at an early age, make new friends and build confidence! This program will help your child develop focus, discipline and energy management in a fun and safe learning environment. Learn the fundamentals of Karate, including kata and self defense techniques. Students can expect to make new friends, enjoy better health, increase self-confidence and decrease stress. Junior Sports is a complimentary program for Mayfair West Members who are between the ages of 8 and 12 years old. 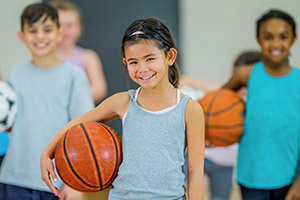 This after school program has been designed for Juniors who would like to play different sports, while encouraging sportsmanship, fun and friendship! Our Group Basketball program offers a low teacher to student ration, which allows players to quickly progress in their game. Each class is one hour in length, and will be customized to fit the needs of each participant. Basketball training will help players improve their shooting, passing, agility, rebounding and more! Children ages 3+ will have fun with friends as they play and watch a movie in Kidspace. Snacks and drinks are available, and dinner can be ordered from our Bistro. Costs vary based on location. Be sure to contact your nearest location’s Kidspace today!